Goldfinch is one of the finest boutique hotels in South India. Elegant, contemporary & uniquely themed, this boutique chain stands out for its understated luxury with sophisticated interior design redefining the intimate experience of hospitality wrapped in personalized service. Walk in at Goldfinch for a caring, warm, personalized and yet wholesomely professional atmosphere, that sets you at peace instantly. Here the décor is inspirational, service is by anticipation and approach individualistic. Located in close proximity of prime areas of business and leisure, the hotels tranquil environs only heighten the luxury quotient and offer optimum comfort to its guests. Goldfinch offers completely satisfying and gracious accommodation, with a full range of modern facilities to make your visit a pleasurable one, whether you are on business or traveling for leisure. With comprehensive conference facilities, dining outlets with excellent cuisine, fitness center. Compact cozy and comfortably these rooms come well appointed to meet every need of the discerning travelers. Equipped with modern amenities they create a comfort zone for its resident. To top it the service personalized and awaiting at your beck and call add to the stay experience. A niche above this is for the choosy traveler. A blend of the well adorned with a hint of luxury and spacious its exclusively packaged for that golden touch. Loaded on all facilities, these rooms are set to make your stay a pleasurable experience. Ring in for extra comfort with staff waiting to deliver your every request, feel the club class difference here. Elegantly designed and furnished spacious suite is lavishly spread for a luxurious feel. Personalized room service is a well appointed feature embedded here. Sana-Di-Ge Sana Dige is a true celebration of food, named after the ceremonial lamp used in mangalorean celebrations it offers an eclectic blend of coastal cuisine of India like the Maharashtrian, Goan, Kerala and Mangalorean. Understated elegance subdued hues and unadorned classic mix defines the ambience and food alike. Walk in to a décor that reflects the coastal belt, a touch of culture spices up the experience for the gourmet lover here. Sana-Di-Ge Banjara Restaurant offers fine dining, and authentic Indian cuisine. The name Banjara means satiated stomach in the regional tulu language. The relaxed environment, with an array of cuisine offers and celebrates the best in Indian, Chinese, Continental and Mediterranean food. Popular for its tongue tingling taste and superior quality food, its one of the finest haunts for connoisseurs. Sana-Di-Ge Roof top open environs with the traditional warm clay oven serving delicacies completes the hearth and home for food lovers. The ambience open to sky and a view to the city, with soft melodious ghazal singing waiting to warm evenings is an experience par excellence. The studio open to informal dine in with a specialized blend of informal cuisine typical in their taste but tangy enough to uplift an informal atmosphere instantly. Try the Amritsari Chole Kulcha with Lassi & Agra Chat Special for that anytime effect. Let the evening mood move you. Move in to kabab studio, made popular with its everyday buffet spreads that do not pinch pockets. Our 50 elegantly crafted rooms have host of excellent facilities to make your day. * Check in check out time is 12.00 hrs. Late checkouts and early checkin are subject to availability. * A checkout before 1800hrs is subject to 50% charges of rack rate, after 1800Hrs 100% of the room rate. * All arrivals prior to 0800hrs are billed from the previous night. * 25% retention if cancelled within 72 hrs. * 50% retention if cancelled within 48 hrs. 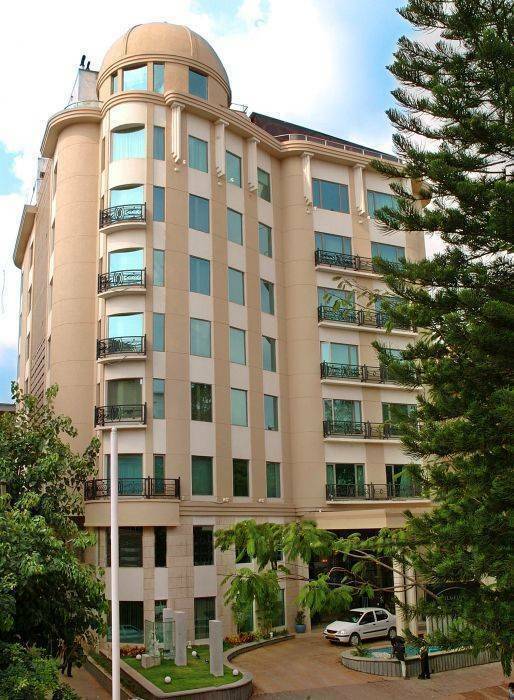 Goldfinch Hotel Bangalore, a boutique hotel par excellence, is the finest of its kind in Bangalore. A paragon among hotels, Goldfinch Hotel Bangaore brings you the sheer luxury, extravagance and class of a 5 star hotel. Goldfinch Hotel Bangalore has an atmosphere that's caring, warm, personalized and yet totally professional. Goldfinch Hotel Bangalore ensures that the decor, ambience and personalized service all create a genuine sense of intimacy and warmth, something that the guest will appreciate on their very first stay with Goldfinch Hotel Bangalore.